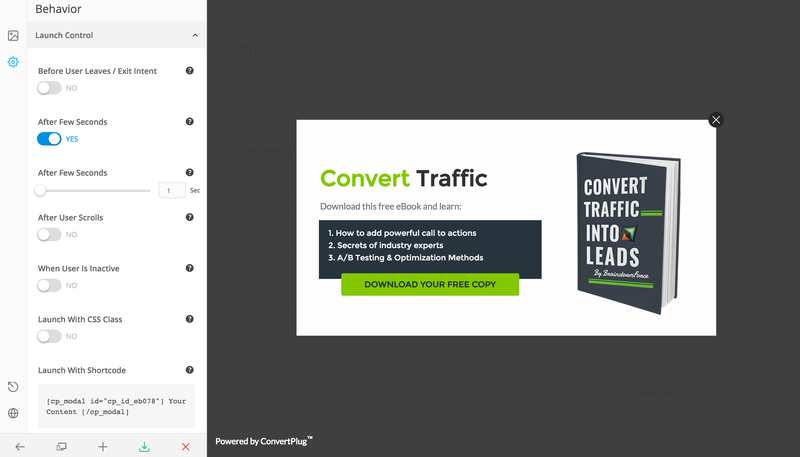 Convert Plus is the all-in-one WordPress Popup plugin that transforms your website into a lead generation powerhouse. Build your email list, bigger, faster and more targeted than ever before. You can create beautiful pop ups in minutes & start converting your website visitors into subscribers, social followers & customers. 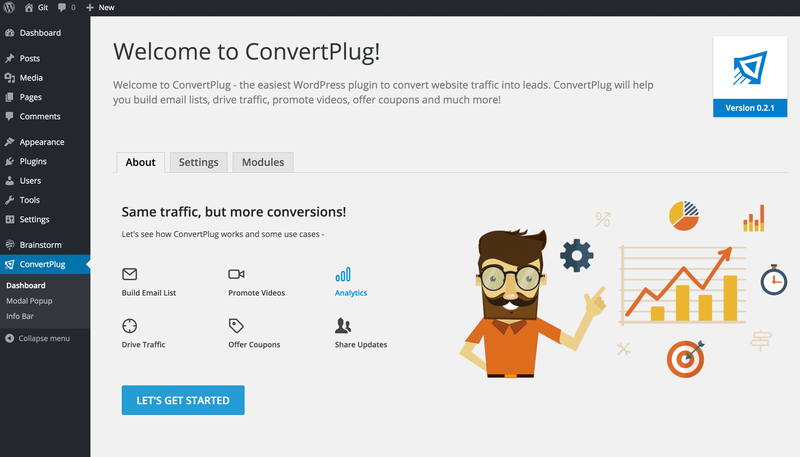 World-class conversion optimization WordPress popup plugin with over 10+ popup display positions, 12+ different visitor behavior triggers & filters. The best thing about this popup plugin is that it has a huge library of over 100+ beautifully designed & high converting readymade templates. Features like the exit popup, opt-in popup, slide-in popup, video popup, on-click popup, social popup, embedded forms, widget boxes, info bars make it the most powerful popup & lead generation plugin. If you are a theme author and wish to bundle Convert Plus within your theme, you can do that at just $24! Know More. Best Ever Popup Plugin for WordPress Website! 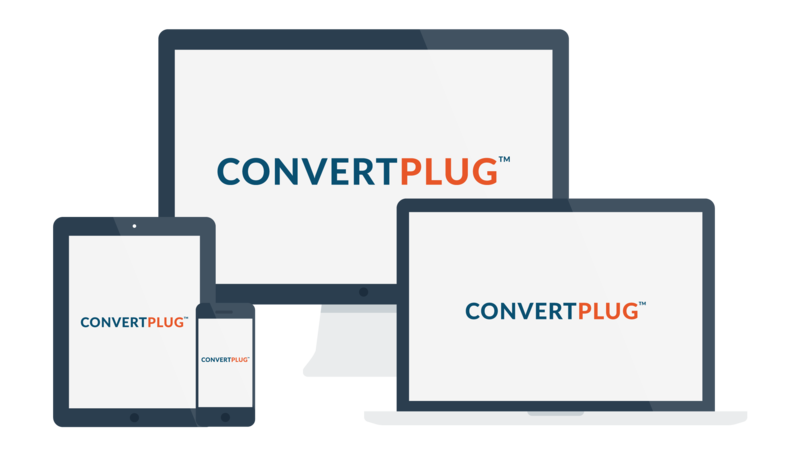 Convert Plus is simple to implement and the most comprehensive yet inexpensive WordPress opt-in Plugin that will build your email list and double your conversions, faster and cheaper than all email list building tools & software available. How does Convert Plus work? Convert Plus does not require any coding or design experience. This is what makes it the best and easy WordPress optin plugin. Just follow a few intuitive steps and you are set to go live in minutes! 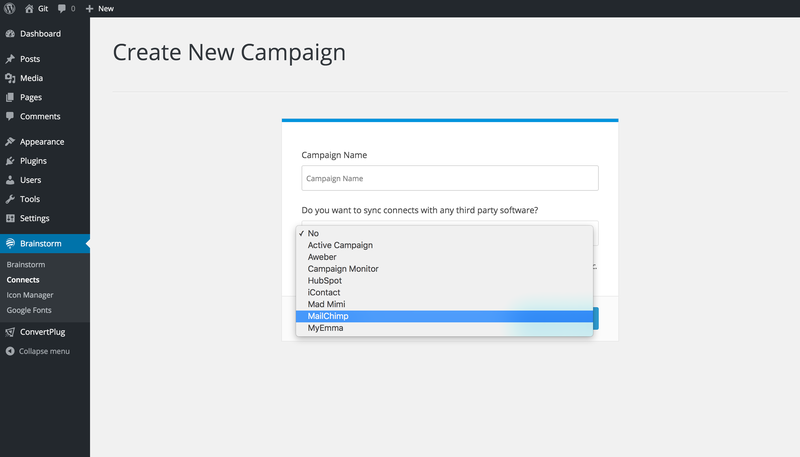 Create a campaign, select a design and customize it per your needs, add triggers and filters, publish the module and sit back and watch how it performs. For more info and a demo check this out: how Convert Plus works? 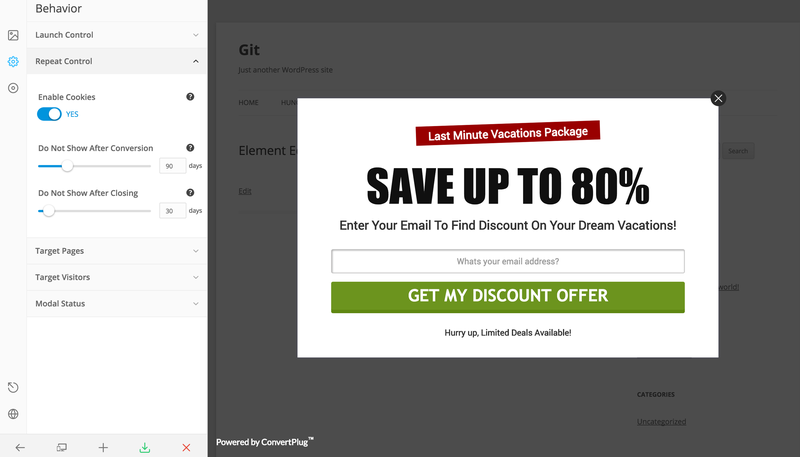 Commonly known as lightbox popups, you can use them to display offers or modify opt-in popups to capture email addresses by using triggers like; exit intent, after scroll, inactivity trigger and more. Whether you wish to display a newsletter widget, a social sharing widget, op-tin widgets, a banner box or simple sidebar forms, widget boxes can be used seamlessly to implement them all. Embed subscription forms on your page. Use shortcodes or the one click settings to display inline forms before, after or within a post on a page. Use Info Bars like notification bars, footer bars, subscription bars or add social buttons to increase your social shares and likes. Use Slide-in popups or scroll boxes, the extremely polite and effective opt-in forms that slide in from the corners of a user screen. Create engaging video popups that compel visitors to halt. Add a form making it a video opt-in, that helps build an email list too. 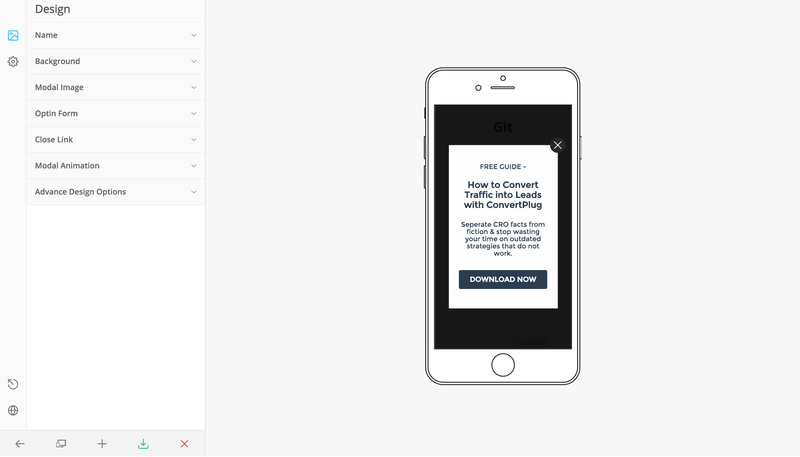 Is a Modal popup too small for you? Convert it into a fullscreen modal that covers the entire screen. Furthermore, use it as a welcome gate, or an exit gate using triggers. With a view to ease implementation of Convert Plus and WPBakery Page Builder together, the Convert Plus addon for WPBakery Page Builder helps create inline forms with easy to use form builder elements. Create inline forms or opt-in pages to attract subscribers. To know how you can create opt-in pages, click here. Use the exit intent trigger that tracks user interaction and displays a popup at a precise time when a user is about to leave a webpage. 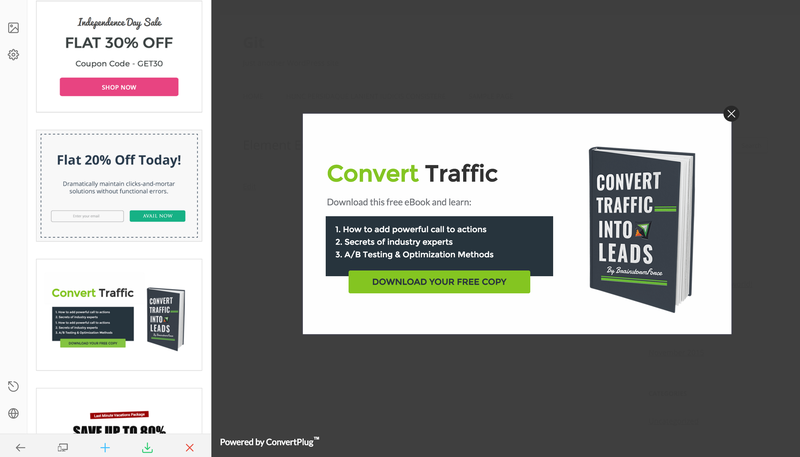 The exit intent popups can be used to implement onsite re-targeting, i.e. re-engaging abandoning visitors. 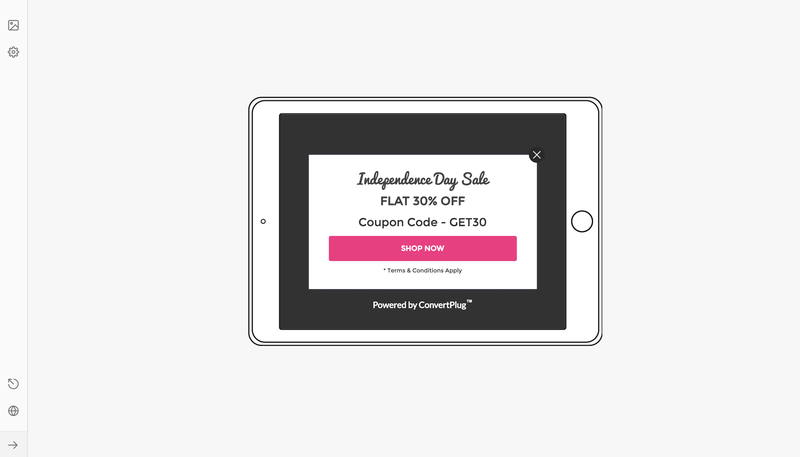 Create countdown timer popups to display limited time offers that encourage users to act quickly. Select the countdown style, set an automatic online timer and design it according to your needs. Make use of the WP Comment form to capture leads. Build an effective email list by adding commenters, the most active users of your website. Commonly used contact forms can be used to grow your email lists. Integrate Convert Plus with Contact Form 7 to capture leads through the contact form on your website. Increase your newsletter signups through the WP Registration form. Give users a chance to fill the signup form and subscribe to the newsletters you intend to send. Use Checkout forms for email capturing. Retain customer information and build an email list of buyers who have performed a transaction on your site and are likely to respond well. 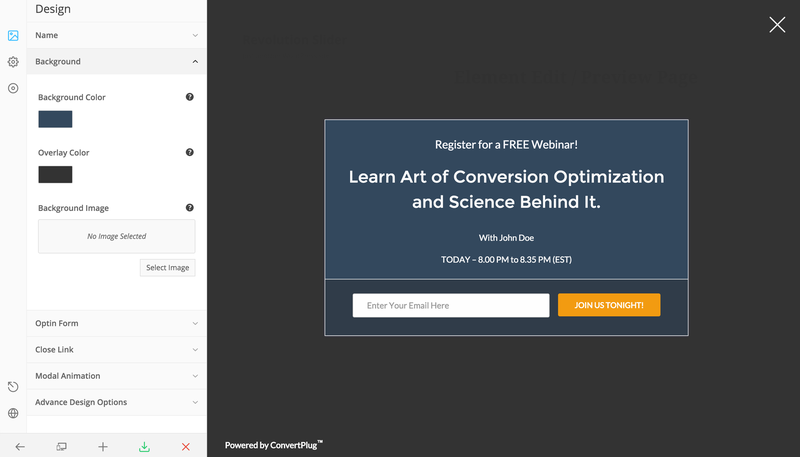 This is among the best converting opt-in forms that work! Convert Plus gives you complete control over the behavior of the modules. 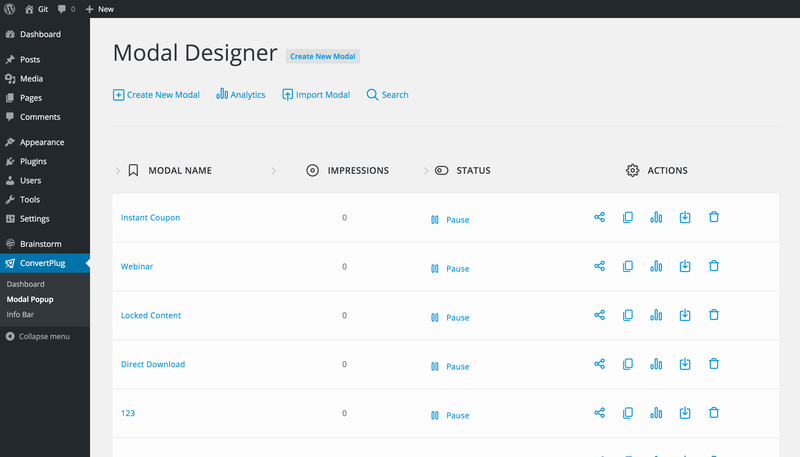 With 100% customizable designs, you can decide the time when the users are most likely to act. 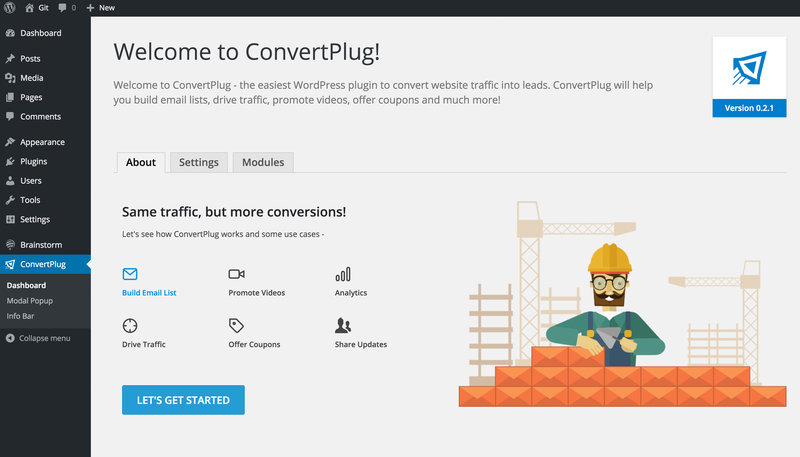 With triggers like the exit intent, the after scroll, inactivity trigger, after post, well timed trigger and more, you can count on Convert Plus 110% to be the best WordPress email list builder. You can choose any trigger that suit your message or combine multiple triggers and meet unlimited creative possibilities! Popups are annoying? No more! Popups are intrusive when you’re interrupting users while they were at something. Imagine, you’re reading a great blog post and a popup appears out of nowhere with no context. Such interruptions are bad and users tend to close such popups immediately as they want to go back to what they were doing. This can be solved with Exit popups, Cookies & Two Step Opt-ins. Exit Intent Popups are far less intrusive. When enabled, Convert Plus will track the cursor movements and trigger a popup as soon as the user is about to cross the top border of the browser window or is found moving towards the close button. Exit popups can be used to re-engage abandoning visitors and offer them additional value, to win them back again. It could be a discount coupon, eBook offer, your latest blog post, and links to your social media channels or offering any other lead magnet that they are looking out for. Onsite re-targeting is by far the best technique to hold back visitors and capture email addresses! Timing plays an important role when you are thinking of popups. You need to decide when a popup will be displayed depending on the message it carries. Well timed popups or opt-in forms are those that can be displayed at a precise time when a user has just arrived on the page, when a user has been interacting on the page for a certain period of time, and so on. All you need to do is make note of the right time to display the right offers for your audience. Scroll triggers are again those that can be set depending on the time and the content your users are referring to. The scroll trigger helps target specific areas on a page. Use the scroll popups or scroll boxes to display relevant messages or opt-in popups that match the content your users are reading at the point of time. It is a common scenario that users often open a site and then abandon it quickly without any interaction. The user inactivity popups or idle timer popups can be used to display engaging messages that compel users to act like you want them to. Use these to display modules that divert users to another page, introduce them to trending offers or simply display a video popup. What will you get out of users who stay on your site for a small amount of time without doing anything productive? Give them a chance to do so with inactivity popups. Users love reading interesting content. But, what happens after they finish reading that? You still have a chance to hold their attention. Since they’ve just spent enough time reading your content, they might want to subscribe to your newsletter or read more similar posts. Use this opportunity to give users what they are looking for through after content popups. Divert them to similar posts, give them a detailed guide about the topic, or ask them to join your subscriber list. Every page on your website aims to target different audiences. While every user might come with different expectations. It is important to customize popups so that they are relevant to the page they are displayed on, and deliver what the user demands. This is handled under Personalization. Use Page Level targeting to customize popups depending on the page, category, post, etc that they will be displayed on. Use Referrer Detection to prioritize users coming from a particular domain. Convert Plus will help you detect the referrer while you can either show or hide popups by selecting a domain/ domains. Use Device Detection to display device specific popups to target users viewing your website through various devices. Use the New vs Old Filter to keep a track of users viewing your website. You can display customized popups for them too! Use the Cookie Control settings to keep track of users who have opted in successfully and those who chose to opt-in later. Use the Logged-in user filter to show or hide particular popups from users who have logged into your website. 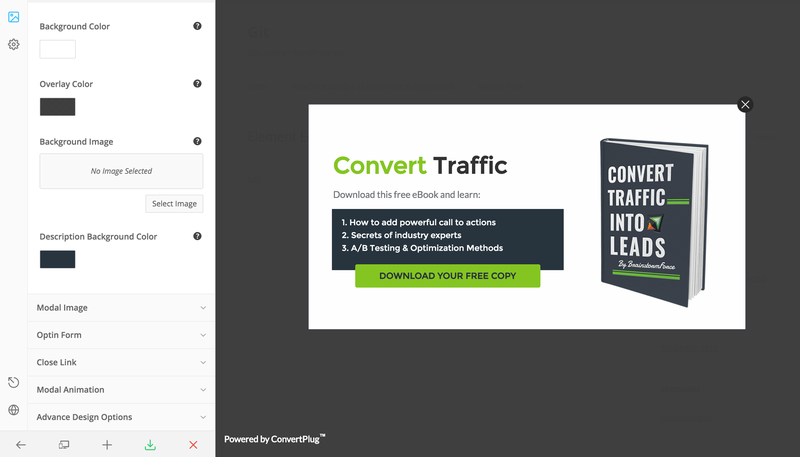 With an inbuilt lead capture tool that lets you store and manage leads, Convert Plus can be seamlessly integrated with many third party email marketing and automation software, plugins and CRMs. Different offers and messages need different targeting positions. Convert Plus offers multiple targeting options so you can effectively choose a position that best suits your message or optin form. 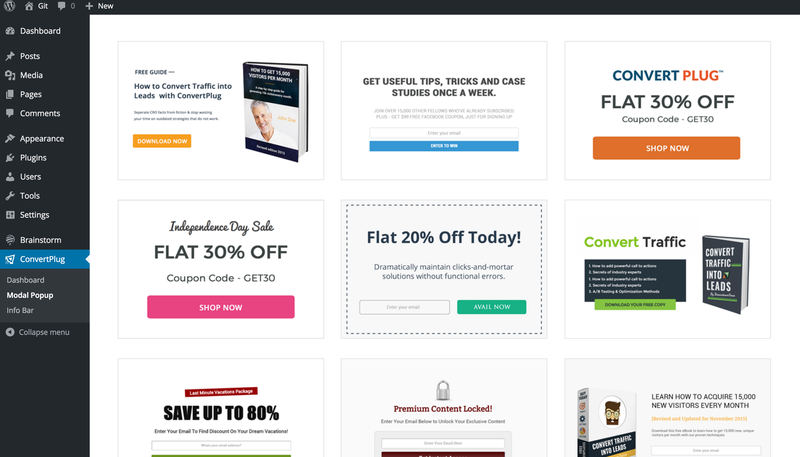 Get up and running quickly utilizing built-in library of professionally designed templates and readymade popups to create your own branded offer within minutes. Boost your conversion rates with attractive modules created in the live editor, and unleash your creativity effortlessly. 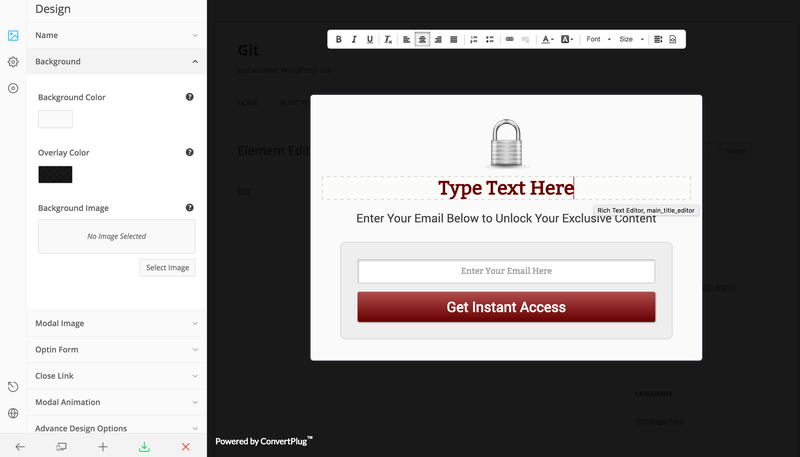 Make changes to built-in templates quickly, without any coding skills. Exclusive feature that creates multiple segmented email lists based on variety of offers & categories you wish to display. 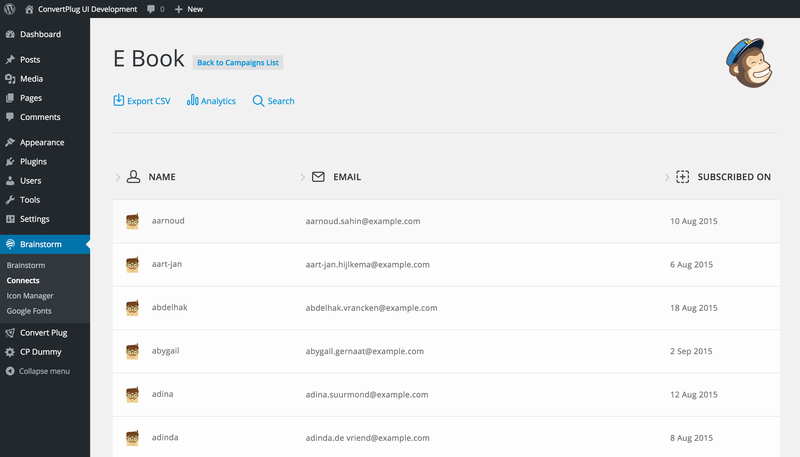 Capture, sync, manage & analyze your contacts all in one place. Capture leads and build email lists through email opt-in forms or external sources like WP Comment Forms, Contact Form 7, WP Registration Form and WooCommerce Checkout Form. Recover abandoning visitors and turn them into subscribers & customers. 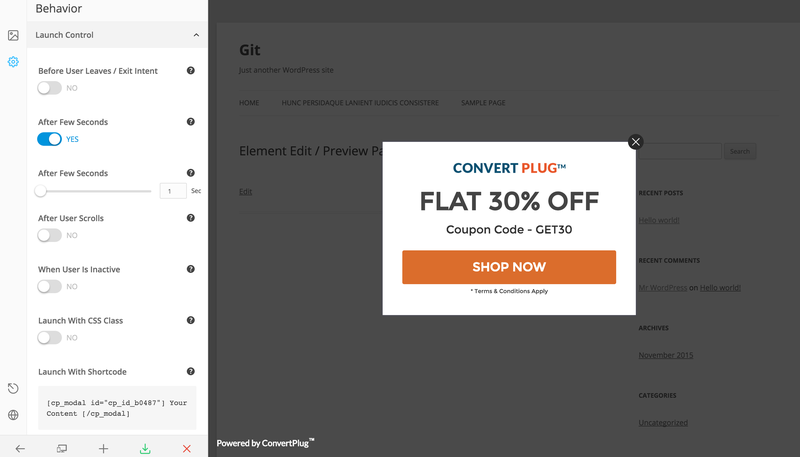 Show customized and targeted offers on exit popups at the precise movement when visitor is about to leave your website. 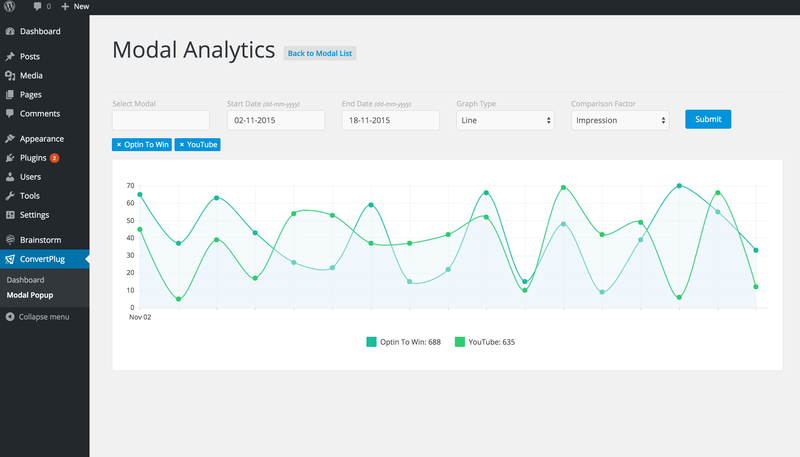 With meaningful analytics graphs, you can easily understand what is working on your website so you can think of better opportunities, and make data-driven decisions to increase your revenue. Unlimited number of real-time split tests to help you find which message relates best for your audience. Now you can stop guessing, test forms & make informed decisions to accelerate your revenue. Utilize the explore action of visitors when they click on a link, image or button to display customized offers. This technology is proven to amplify conversions & generate quality email list. Use the social share styles to increase social followers, shares and likes. You can use modal popups, slide-in popups, info bars, sticky bars or inline modules for social sharing. 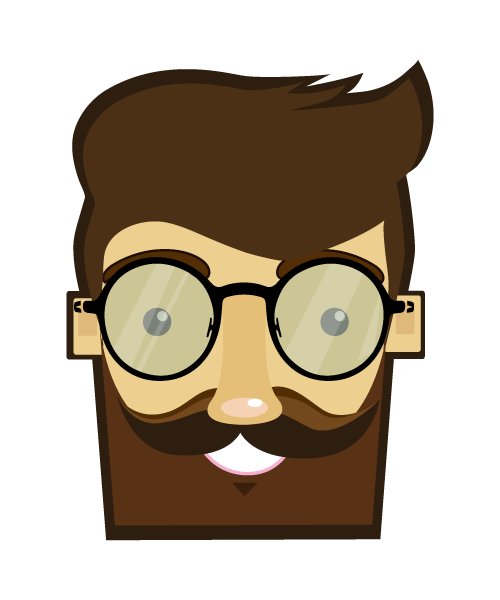 “Such a great plugin at reasonable price. I am using it on my personal wordpress blog http://wpvkp.com/ and it works perfectly. I have changes two themes since installing this plugin, and it seems that it works with all of my themes. 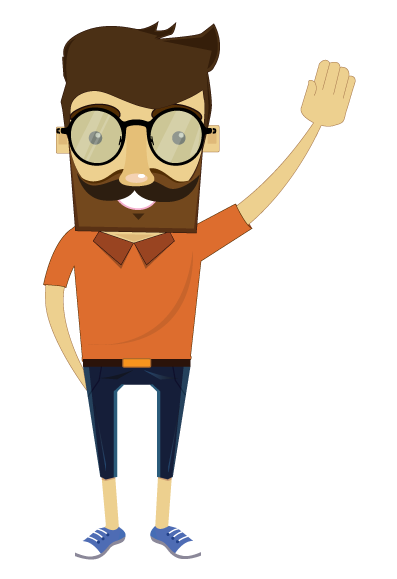 “Great plugin and alternative for expensive conversion optimization solutions. Templates are really helpful and everything can be customized.